Govia Thameslink Railway introduced eight-car Class 700/0s onto its Great Northern network this week. The first service was the 0410 Peterborough-London King’s Cross, formed of 700052. This electric multiple unit was also the first ‘700’ to reach Cambridge in passenger duty, running as the 0604 King’s Cross to Cambridge and 0756 return. Other Class 700s in action were 700024 (which started with the 1712 King’s Cross-Peterborough), 700049 (which started with the 0510 Peterborough-King’s Cross), 700050 (starting on the 0726 Peterborough-King’s Cross), and 700051 (1617 King’s Cross to Royston). Twelve-car Class 700/1s were introduced last November (RAIL 842). February 19 was the first day in traffic for 700050/052, while the others had operated on Thameslink trains. As Great Northern has got few Class 700’s that are replacing the Class 365’s. The Class 365’s are to be stored and possibly could be facing the scrapyard. 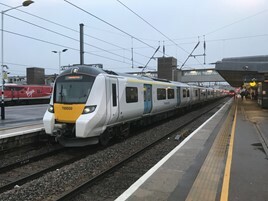 Whilst Siemens are to manufacture the 25 Class 717’s that will replace the Class 313’s on the Moorgate Line. And the Ex-GN Class 313’s could be transferred to Southern to work with the current Class 313’s on the West Coastway and East Coastway lines. Or could be sent for scrap. I think that the Class 365’s could be used in South Wales once the electrification to Newport & Cardiff and electrification on the Welsh Valley lines is completed. Or Class 365’s could be cascaded to North of England as the North needs more extra trains as the South is getting new trains.